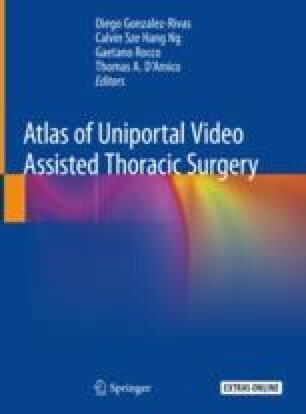 The development of imaging technology has recently facilitated uniportal minimally-invasive thoracic surgery techniques. Cone-beam computed tomography (CBCT) shows promising results in visualizing the target lesion and its surrounding critical anatomy, with an average error of less than 2 mm. The hybrid operation room (OR), which integrates CBCT and the OR, is capable of providing unparalleled real-time imaging of the patient, which can be incorporated into electromagnetic navigation bronchoscopic marking of pulmonary lesion to reduce the likelihood of navigation tool malpositioning and, hence increase procedural accuracy. Furthermore, implantation of hookwires or microcoils that are widely used to localize pulmonary lesions can proceed in the hybrid suite, eliminating the common complications and discomfort associated with the conventional workflow carried out in the radiology suite. Implantation displacement leading to localization failure can also be reduced, and sublobar resection can be performed without resecting a larger area of parenchyma than desired. This hybrid OR provides a one-stop concept for simultaneously diagnosing and managing tiny pulmonary lesions. The online version of this chapter ( https://doi.org/10.1007/978-981-13-2604-2_39) contains supplementary material, which is available to authorized users. Advanced Multimodality Image Guided Operating (AMIGO). 2016. http://www.brighamandwomens.org/research/amigo/default.aspx. Accessed 1 Sep 2018.